Document Management of the Invoice and allow extracting key metadata fields. Define and execute workflows within Sharepoint. Send notifications, reminders for approvals and delegate approvals for effective workflow routing. Enterprise search to search for invoice within SharePoint. 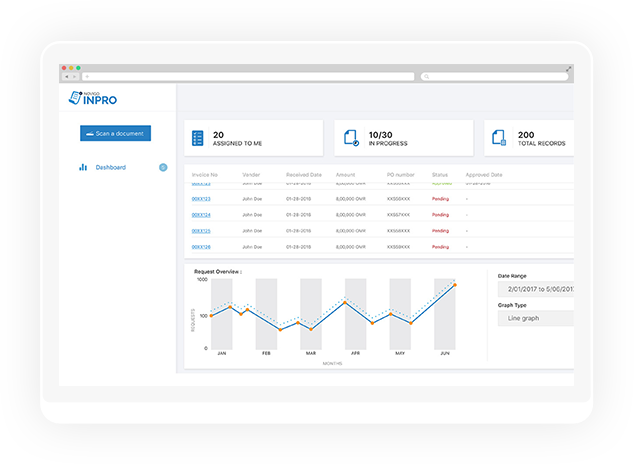 Inpro is a scanning application which is integrated with the scanner and allows the user to scan all types of documents or upload existing scanned documents. The system includes a predefined SharePoint Approval Workflows for quickly setting setting up the process in SharePoint. A complete Audit Log for the invoice is available, including scanned PDF of the invoice for quick verification and Approval. The Global Search works in conjunction with SharePoint Enterprise Search and allows users to search for Invoice based on multiple key fields like Invoice Number, Dates, Vendor etc. You can quickly and easily scan any custom PDF that can be sent to any destination by extracting the meta data information. All document management features of SharePoint can be leveraged. Allow users to define and execute workflows within SharePoint. 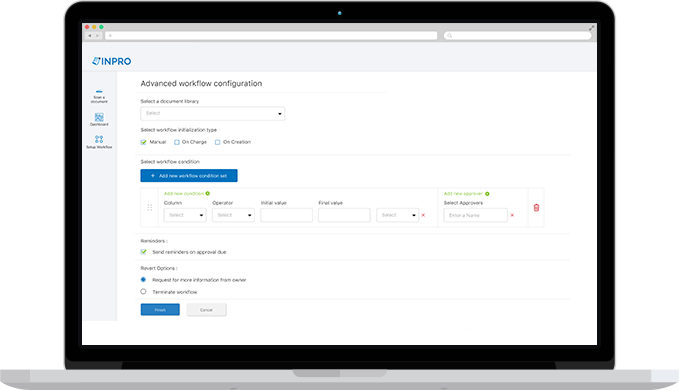 Solution includes a redefined Approval Workflow framework which allows to define workflow based various condition matrix along with multi levels of approval. Intuitive dashboard for quick overview of all the tasks assigned. 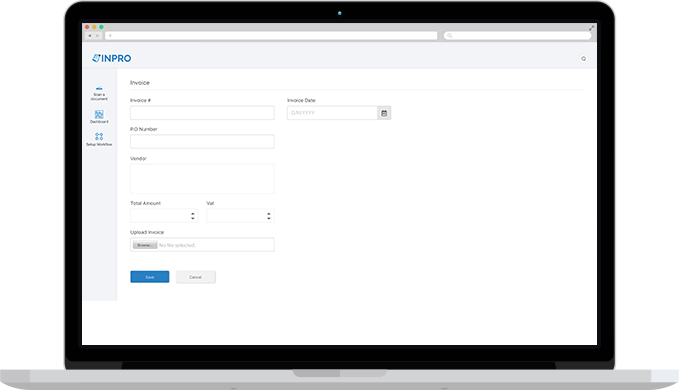 Provides graphical overview of the task/invoice status on the time basis. SharePoint's powerful enterprise search to search for invoices within based on any of the meta data filled or by uploaded document content. Using the scanning application, a document can be scanned and the extracted meta data information will fed the SharePoint document library. System also allows user to upload the document manually and retrieve the key fields and store in the SharePoint. Provides one step workflow set up configuration window on the selected data source by specifying very minimal info. Define N number of sequential approval levels dynamically by specifying the user name at every level. Advanced mode allows to set up the workflow based on the various condition matrix. Once the data source on which workflow need to be set up is selected corresponding fields are populated for the condition selection. These conditions can be repeated as condition set and each set can have its own approval levels. This will be helpful to separate the workflow configuration for various scenarios in terms of different condition scenarios. 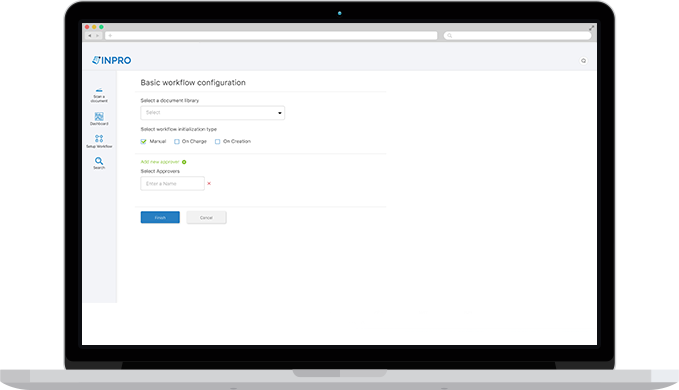 Further there is an option for customized alert trigger and workflow rejection behavior. Dashboard tailored for best User Experience. On the dashboard user can see tasks assigned to him/her by the approval status. Also there is a provision to see the others tasks which are in the in progress ony other state. Allows user to quickly navigate within the application. User can review the task by selecting the task from the dashboard. Page will load with the approval history if any on the left side and uploaded document on the right side. User can add comments and either approve or reject the task.